Ginger tea VS cold season: GO! So, I mentioned in an earlier post that was making some ginger tea in the dehydrator. 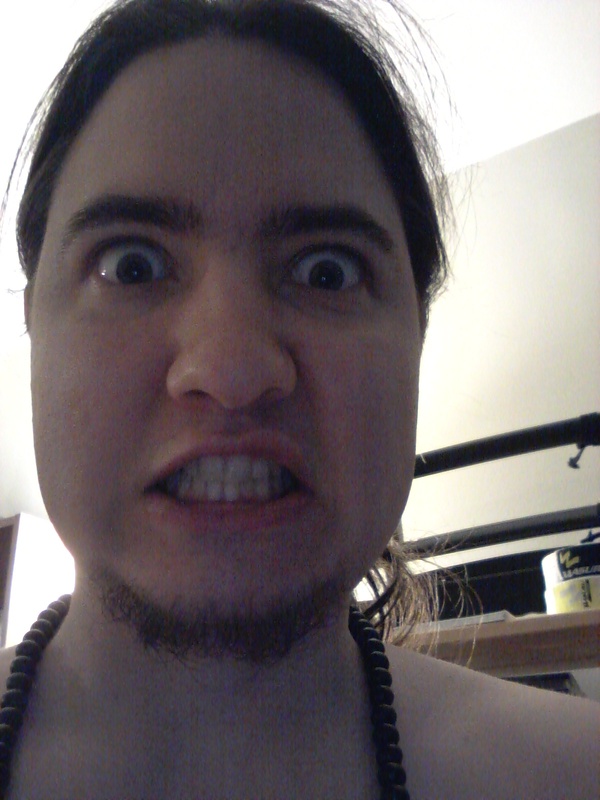 I decided to share this arcane knowledge with the rest of the world because the tea it produces is absolutely divine. STOP MESSING WITH MY TEA DAMNIT! Ahem. Sorry. As I was saying, sometimes, I just want a tea that aids in digestion or calms an upset stomach. Yes, you might want to add some lemon to it if you have a cold, or some honey if you’ve got a sore throat, but most of the time I just like the clean, spicy flavour of ginger. Here’s how we do it: We take a ginger root, which you can buy for cheap at just about any grocery store. See that vegetable peeler just off to the right? Yeah, put that away. That’s not going to help you. This bad boy is what you want. Your hands will thank me later. Now, stick the cheese grater on a piece of wax paper, or tinfoil, or a plate, or what-have-you just to catch the ginger as it falls on the other side. 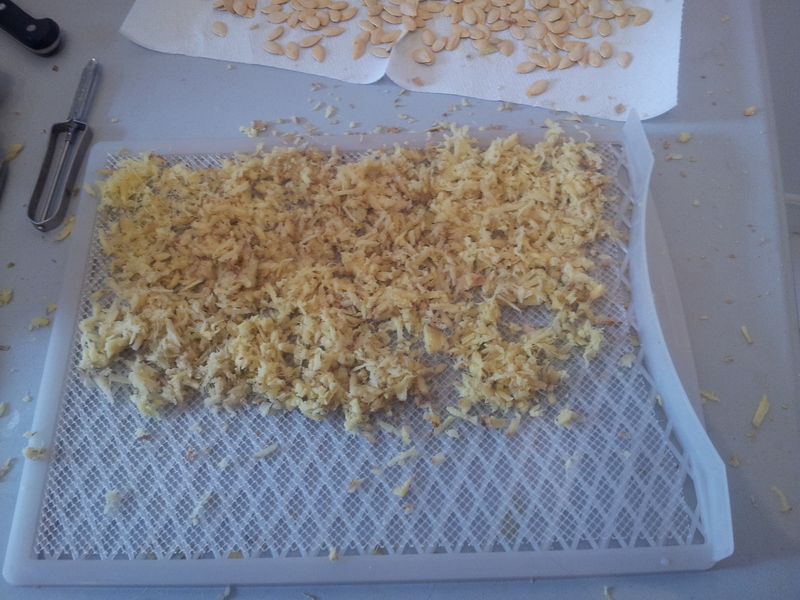 Break off manageable pieces of the ginger root and prepare to begin grating. BUT, before you do, there’s something very important you need to know. Ginger root is a root. Yeah, I know. Thank you Captain Obvious. You’re welcome. Roots are highly fibrous and they have to be in order to draw moisture up into the plant. So as you begin grating, you’ll notice that the root has stringy little “hairs” inside that are frustratingly strong. 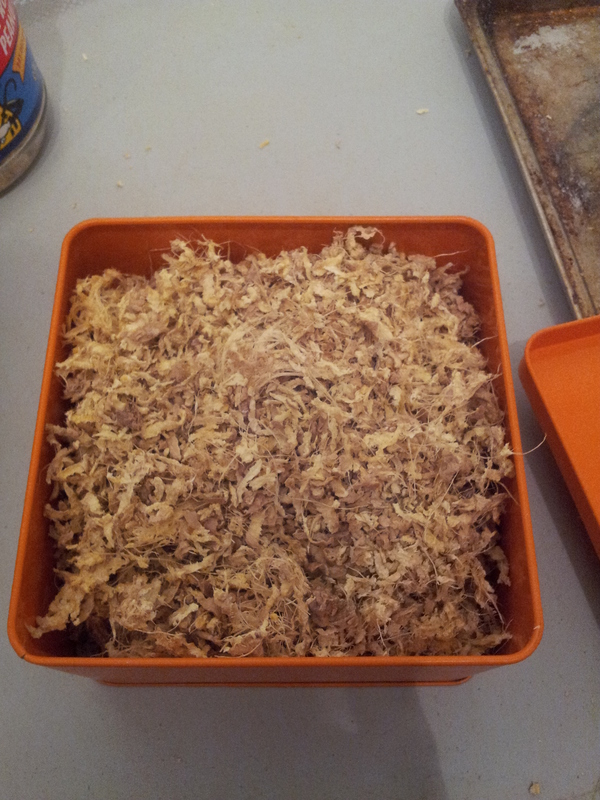 In order to avoid getting a big wad of shredded ginger stuck in a trap of root fibres, you’re going to want to keep rotating the piece of root you’re grating in order to break those fibres as you work. 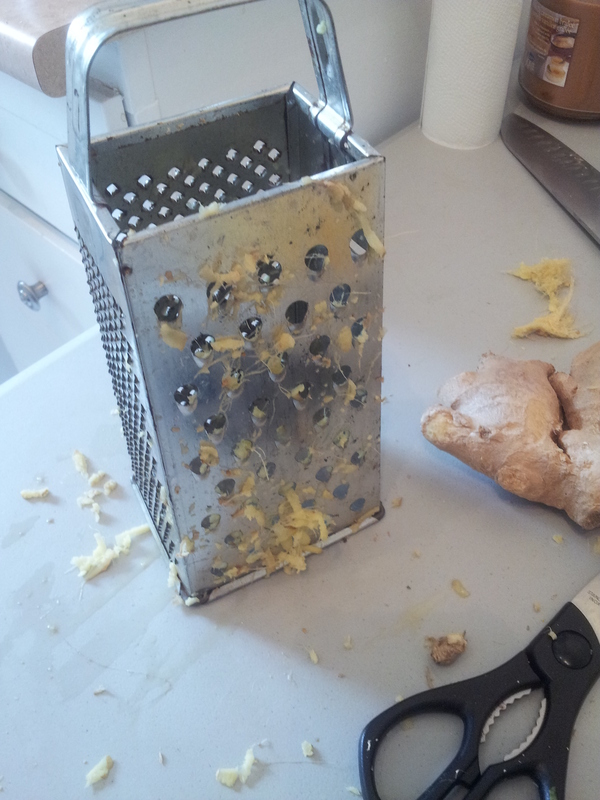 I find a pretty good method is to put the ginger root to the grater, give three strokes, and then give it a quarter turn. One, two, three, turn. One, two, three, turn … and so on. It goes pretty fast once you’ve got a good rhythm going on. Next, we put the shredded root on a dehydrator rack. You’re going to need to put a mesh sheet down on the rack in order to avoid the little bits falling through the holes. 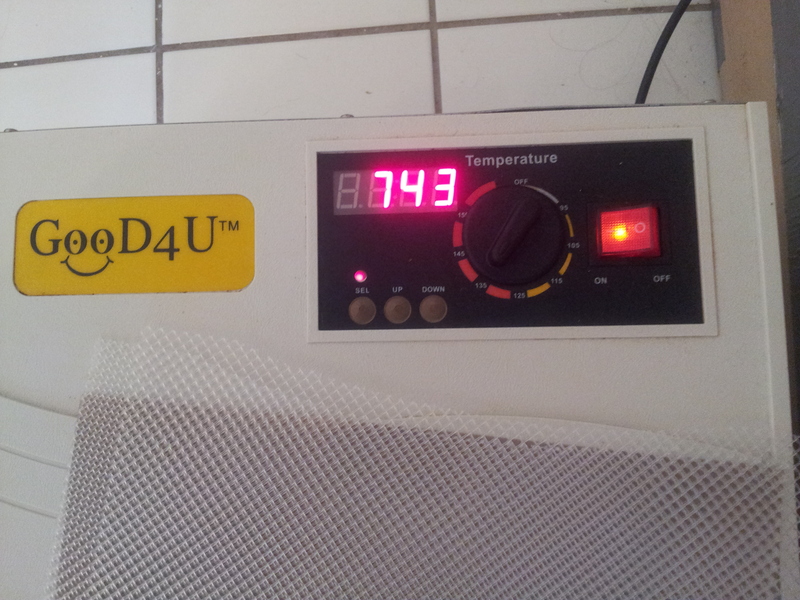 In case you’re wondering which dehydrator I have, I purchased mine from Good 4 You Dehydrators. Mine is the six tray version. If you don’t have a dehydrator, you can leave the ginger to dry on a screen. Just make sure that there is lots of air flow all around whatever it is you’re drying it on, and that the room you’re drying it in isn’t too humid. If you want to put a fan on it to help it dry faster, you’re going to need to set up something to stop the particles of dried ginger from flying all over the place. Try a clean cardboard box and make sure the fan is on its lowest setting. 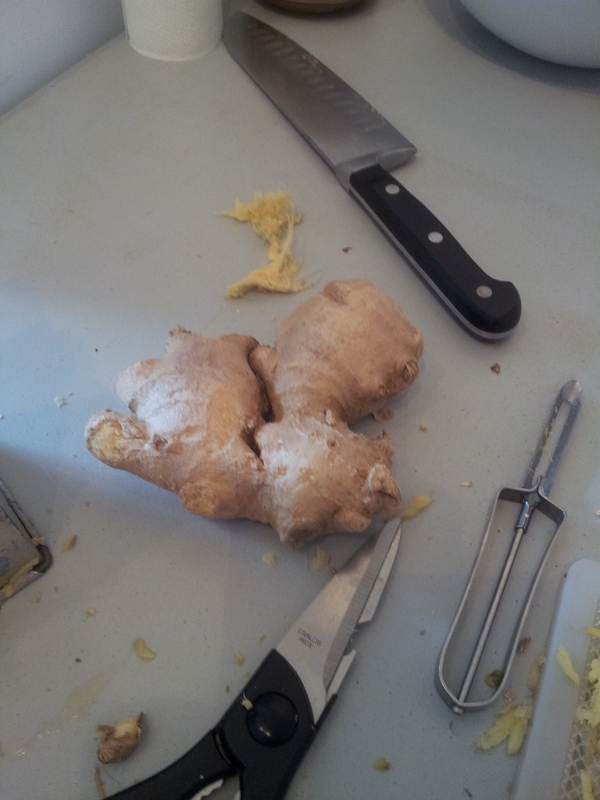 The ginger will be extremely light when it’s dry and you’ll be surprised at how much of a mess the tiny bits can make. Honestly, it’s best if you can just leave it alone to dessicate. Now, stick the racks of shredded ginger into the dehydrator, set it to 135 degrees and leave it alone for about eight to ten hours. See why I recommend a dehydrator? Yeaaah, it’s going to take awhile. The good news is, if you shred up three ginger roots about the size of your hand (as I did), you’ll end up with enough to fill a 4″ x 4″ x 3 ” container jam-packed with tea. Given that you only need a teaspoon of shredded ginger to make ginger tea, this may very well last you all year. To brew the tea, just boil some water, stuff a tea ball full of shredded ginger, and let it steep for about six to ten minutes depending on the strength you want. If you find it’s too spicy for you, let it steep for a shorter amount of time, or use less ginger. Thanks for stopping by. Feel free to comment or ask questions. I respond to everybody. And have a lovely autumn! Brilliant! Can’t wait to try this out myself. Previous Previous post: More Editing! Woo!